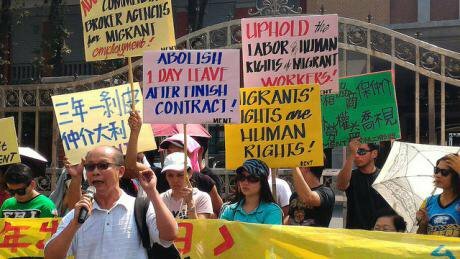 Migrant workers need rights and safety nets, yet sob stories of abuse will not bring about such change. Organising, on the other hand, will. Emergency rooms, social security offices, US Immigration and Customs Enforcement outposts consigned into strip malls: places that manage to be dreary and fluorescent at the same time. A decade ago, on any given day of the week, I’d be bringing an abused domestic worker through some new round of administrative hoop-jumping in one of these places so she could be classified and serviced as a ‘victim of human trafficking’. But was any of this really making a difference? It took me a few years on the job to figure it out. I started work at the Institute for Policy Studies, a progressive think tank in Washington DC, as an intern in 2003 and again as a full-time employee a few years later. I wanted to help women workers claim dignity on the job. Several years before this, in 1997, colleagues started the Break The Chain Campaign (BTCC) to combat the deafening silence surrounding trafficked domestic workers in diplomatic households in the Washington DC area. They (now we) wanted to bring attention to the issue and demand change on the part of these governments and the US State Department. We quickly realised, however, that there were few services available to help workers heal and get back on their feet after leaving abusive work. Back then there was no Trafficking Victims Protection Act; there wasn’t really an ‘anti-trafficking movement’ akin to what we see today. Our orientation had always been towards worker rights and migrant rights; we didn’t need a new label. But we did need more than what the homeless shelters or food banks could offer. We decided to quietly hire a social worker and lawyer to offer small-scale casework from within our think tank walls. It made sense as the time, and we filled a niche for a shockingly underrepresented population of survivors for 13 years. From the beginning, we at the Institute for Policy Studies had been adamant in ensuring that our programme was fully rights-based: we prioritised informed consent as a prerequisite, our core values were respect and self-determination, and we held regular Sunday sessions where workers could get together and learn. Beyond services, we did two unexpected things: worker rights activism (you could find us picketing in front of the World Bank regularly) and political education. With the survivors in front, we were successful in getting the World Bank and International Monetary Fund (IMF) to implement worker rights orientations, in which newly arrived workers learned about their labour rights under the visa programme, and this in turn set the stage for continued improvements in the A3-G5 visa programme to this day. It took several years before I understood that, even though case work isn’t particularly transformational on its own, helping workers with visas, family reunifications, jobs, and housing is a necessary part of political activism. People have a harder time getting out into the streets when they’re worried about deportation or homelessness. Our experience has shown us that good anti-trafficking service programmes must answer both human needs: the personal and the political. By 2010, an industry around human trafficking had overtaken us. There was urgency in spreading ‘awareness’ of the issue as a crime with innocent victims, though decidedly less urgency in discussing the importance of social safety nets, labour rights, and migrant rights for addressing this ‘new discovery’. At the same time, the Institute for Policy Studies was having difficulty sustaining the necessary staff and funding for both casework and activism, so we opted to phase out our direct service work and move back into advocacy. From where I stood I saw two parallel narratives unfolding. On the one hand, we were witnessing the latest instalment of a 200-year-old story on the invisibility of domestic workers and the disrespect of their work, minds, and bodies. On the other hand, we had a new chapter in the equally old but less well-known story of worker organisation against abuse on the job. Premilla Nadasen covers these narratives well in her latest book, Household Workers Unite. I also saw a third story emerging before us, the one about the ‘white saviour industrial complex’ readying to launch an epic crusade against (a stereotypical rendering of) human trafficking. Over the coming years this would spin a narrative of good vs. evil so uncomplicated that it could be summed up in a 300-word case update to the Department of Health and Human Services. It would also deploy unfettered vice squads and turn our moral eyes away from root the root causes economic and social inequity and toward organised crime. Because the workers had educated us about what really happened before they were trafficked and what they wanted to see changed to keep it from happening to others, we chose to step into the story about organising. This was the only area, we felt, that could shift power enough to make real change. We partnered with the National Domestic Workers Alliance (NDWA) and eventually helped them build trafficking and labour exploitation into their campaigns. Years of meetings with Damayan, Casa de Maryland, and Adhikaar (all grassroots workers’ organisations) had already revealed our commonalities. You could take any of our stories and exchange it with one of theirs – that’s how ordinary the patterns of abuse of domestic workers were, and still are. Soon we launched a campaign called Beyond Survival and began to create a programme of leadership development for survivors, political education, policy advocacy, and mobilisations. We also urged the NDWA groups to partner with rights-based service providers so that we could supplement organising with funded case management. Consider the 2014 case of Sangeeta Richard, a domestic worker from India allegedly exploited by an Indian consular officer. With her permission and in collaboration with dozens of allies, we launched mobilisations in seven cities across the world. This included a sign-on letter that gathered signatures from unions, service providers, and community groups. Our worker leaders, most of them having never met Sangeeta, created and practiced talking points, made signs, and led their protests in front of Indian embassies. Despite the power and influence of this consular officer, organising allowed the worker experience to be heard. The consular officer was soon indicted and fled the US. The counter-narrative surfaced by the workers has had reverberating effects on policy ever since. One key tenet of the organising approach is challenging activists to go beyond awareness-raising and even beyond just advocating for change, and toward changing who the advocate is. NDWA groups offer political education programmes to workers that unpack the intersections of capitalism, trade, immigration, race, and gender. This helps survivors be the spokespeople about why this abuse happens and how it persists. Instead of just telling a sad abuse story and then turning the microphone over to someone else, workers are positioned to be the voice and face for change. I’ve stepped away from the work and handed it over to the organising groups on the front lines. For real change to happen, we, as a global society, need to turn away from the victim narrative that calls for policing and charity, and toward the idea that organising in solidarity with workers can be the best prevention. Sure, we need services and we need good, rights-based organisations to be operating them, but they’re only one piece of the puzzle. They should be seen as setting the groundwork for organising, not an end unto themselves. I dream of the day when advocates have worked themselves out of their jobs, and when a migrant domestic worker will be the one writing the next chapter of the story.